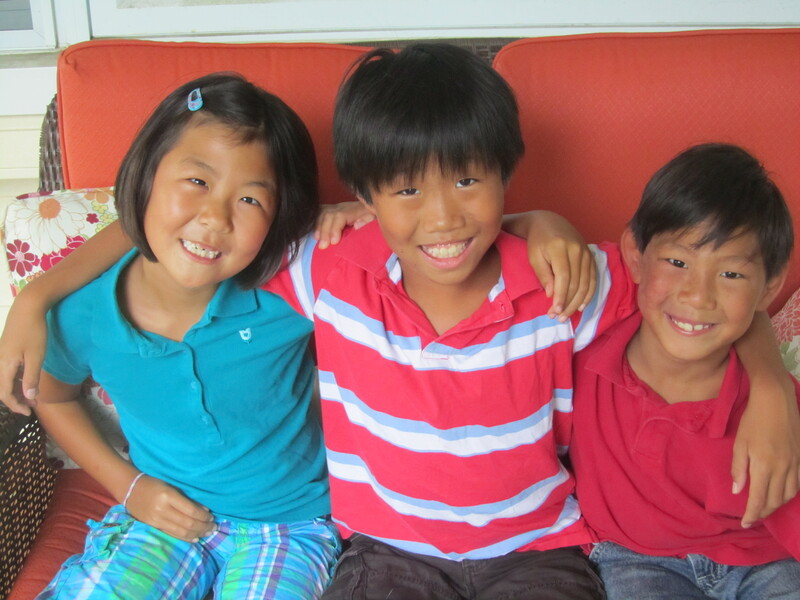 My 3 kids are adopted from Korea. In learning about the culture as we prepared to adopt, I fell in love with the country, as well as the food. Korean barbeque (Bulgogi) is phenomenal, and kimchi is a spicy, addictive condiment that I love. (I even made kimchi once or twice…a process that takes several days…and my sweet son prefers mine to anyone else’s…good boy!) 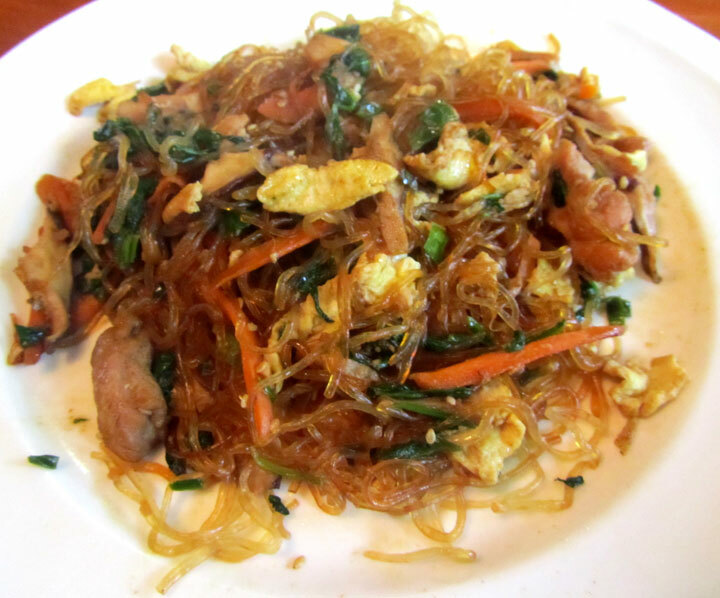 But one other dish I really enjoy is japchae, which is a stir-fried noodle dish made with sweet potato noodles. 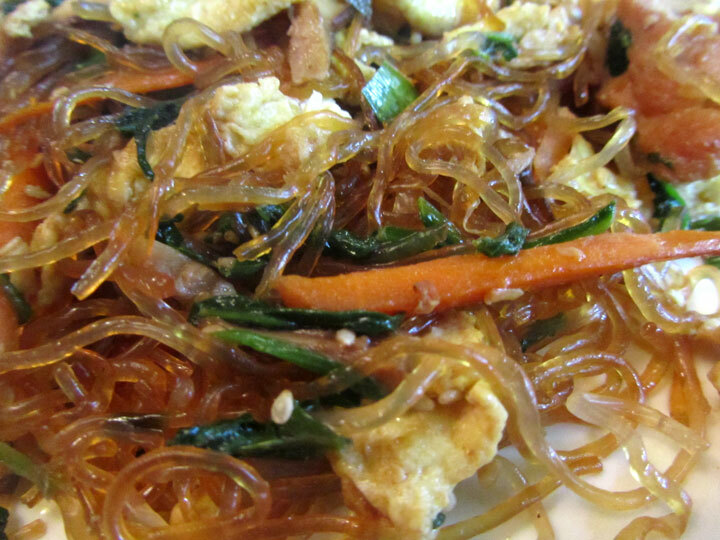 The best japchae I ever had was cooked by my son’s foster mother in Korea. When we went to her apartment to meet our new son for the first time (he was 2) she had a huge spread of traditional Korean food. It was SO delicious! I’ve made japchae in the past, but I always messed up a bit with the sweet potato noodles, which can easily be overcooked. However recently, I finally took the plunge and ordered some kelp noodles. I had been reading about them on various gluten-free food blogs, and I was curious. The reviews for them on the Amazon product page were really positive. They are not a grain, but rather a sea vegetable. And there are only 18 calories in an entire package (6 calories per serving.) For real! But the best part is that they are, of themselves, fairly tasteless. They take on the flavor of whatever they’re cooked with, but they retain the texture of a rice noodle. Plus they’re full of nutrition. They have more than 70 minerals, including potassium, magnesium, iron, calcium and iodine. They also contains enzymes, vitamins, trace elements, and more than 21 amino acids. It’s safe to say they’re really good for you. So I decided to attempt japchae again, this time with kelp noodles. And it was perfect! It’s safe to say I’ll never go back to sweet potato noodles for this dish again. Rinse the kelp noodles in cold water. Boil some water in a large pot, and add the kelp noodles. Cook for 5 minutes and then remove from heat. Let it sit in the hot water until you’re ready to use the noodles. Meanwhile, combine 2 Tbsp tamari, 1 tsp sesame oil, 1 chopped clove of garlic, the ginger, 1/3 of the chopped green onion, and 1/2 of the sesame seeds in a small bowl. Slice the chicken thighs into strips, and add to the tamari marinade. Let sit while you slice the carrots, mushrooms and spinach. After all vegetables have been prepared, heat a tsp of sesame oil in a large frying pan, and add a little of the garlic. Add the chicken and all of its marinade, and stir fry until the meat is cooked through, about 5 minutes. Remove the meat from the pan and put on a plate. In the same pan, add another tsp of sesame oil and some garlic, and cook the carrot strips until softened, but still with a bit of crunch left. Remove the carrots from the pan and put on the plate with the meat. In the same pan, add another tsp of sesame oil and some garlic, and cook the mushrooms until softened, about 2 minutes. Remove the mushrooms from the pan and put on the plate with the meat and carrots. In the same pan, add a bit more sesame oil and garlic, and toss in the spinach. Cook for a minute or so, until wilted. Remove the spinach from the pan and put on the plate with the meat and vegetables. Add enough sesame oil to coat the bottom of the pan, and then add the scrambled egg. Tilt the pan to cover the bottom with egg, and allow it to cook in a thin sheet. When the egg is almost done, use a spatula to break it up into bite sized pieces, and then remove the egg to the plate with the meat and vegetables. Add another tablespoon of sesame oil and the remaining garlic to the pan, and then add the kelp noodles. 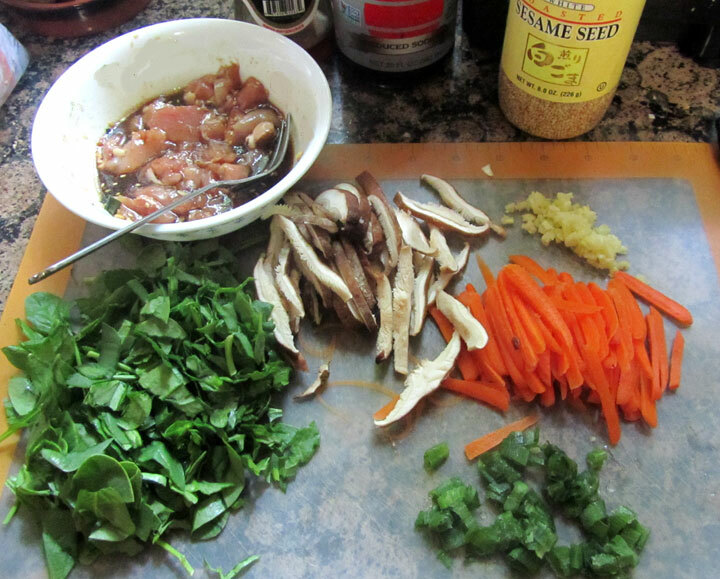 Stir-fry for 2 minutes to get up all the pan flavors that have accumulated into the noodles. Dump the plate of meat, vegetables and egg on top of the noodles, along with the remaining green onion, and stir fry it all together for another 2-3 minutes. Taste and add another Tbsp of tamari if the flavor needs it. Sprinkle the top with the remaining sesame seeds, and serve! Have you tried kelp noodles? What did you think of them? How do you like to prepare them? Would love to read your thoughts in the comments below! This entry was posted in dinner, Gluten Free, Healthy diet, Paleo, Refined Sugar Free, vegetables and tagged chicken, dinner, food, gluten free, gluten free food, healthy, japchae, kelp noodle, kelp noodles, lunch, noodle stir fry, recipe, refined sugar free, sea vegetable, stir fry. Bookmark the permalink.